Endangered is a modular, cooperative game where the players are trying to save endangered animals. You’ll need to work together to convince UN Ambassadors to pass a resolution to protect the animals and their environment. If you can get 4 ambassadors to vote yes, you win! 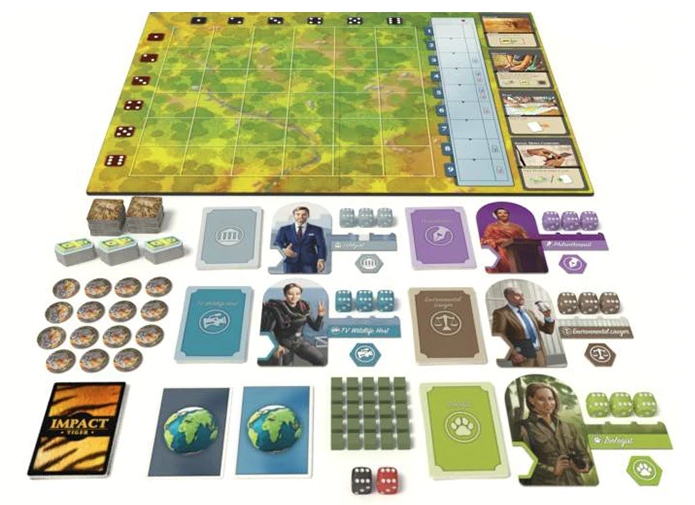 Players will be able to take on the roles of Zoologist, Philanthropist, TV Wildlife Host, Lobbyist, or Environmental Lawyer; each of which has their own unique abilities. Each turn, players will roll dice and use them to active action cards. Once actions are taken, pairs of animals have a chance to mate and destruction tiles will be added to the board. Do your best to save the animals and make a good impact on the environment. I love games that can double as educational as well as fun and Endangered packs a powerful message about taking action on conservation before its too late. 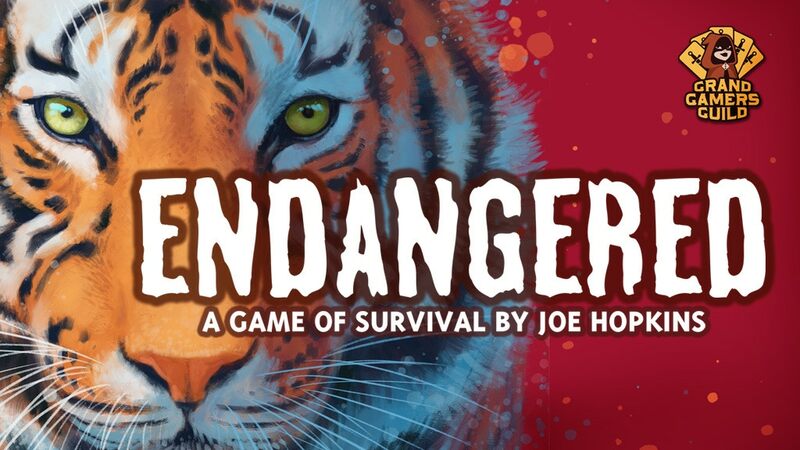 Check out Endangered on Kickstarter here for more info. 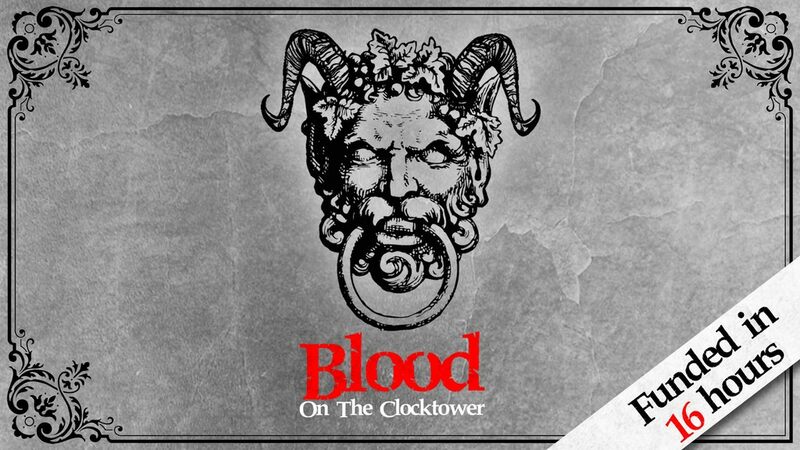 Blood on the Clocktower is a thoughtful evolution of the social deduction genre. It is set in the village of Ravenswood Bluff where the town’s storyteller murdered and left impaled on the clocktower. 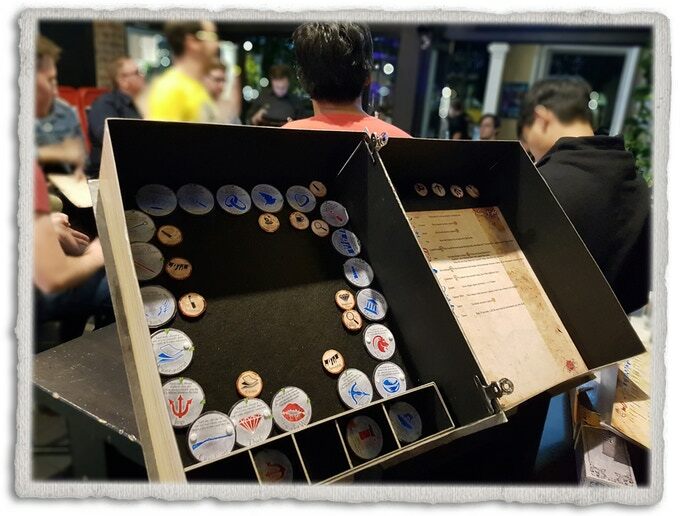 There is a demon lurking somewhere in the town and it is up to the villagers (players) to sort or who might be working with the evil creature. Similar a role-playing game, Blood on the Clocktower has a storyteller who oversees the game and guides the action. Players fall onto one of two teams (Good or Evil) and will spend the day phase trading information and spreading lies. During the evening phase, the storyteller can activate players to let them gather information, cause some trouble, or even kill someone. I usually don’t like games where players can die, but, in this case, death doesn’t mean elimination. Players can continue to play and even win as ghosts haunting Ravenswood Bluff. There is a lot to like about Blood on the Clocktower and you can learn more about it on the Kickstarter here. 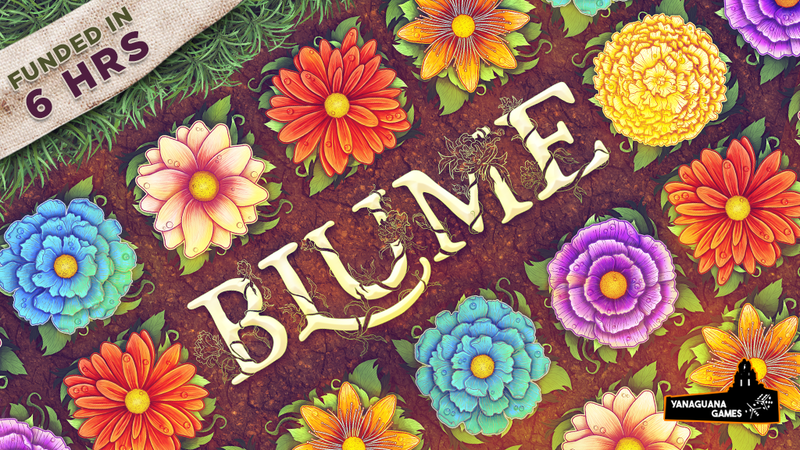 Blume is a beautiful tile laying game about growing and selling flowers. 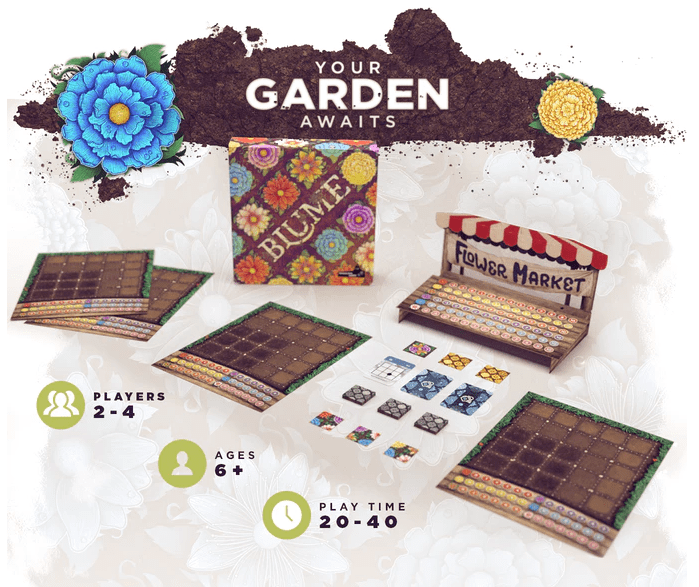 Each turn players will be placing tiles to make flowers and afterwards they’ll prune their gardens in order to make way for new flowers. During the game players will be able to either increase their greenhouse supply or influence the market, which will determine the value of the flowers in everyone’s greenhouses. At the end of three rounds, the player with the most valuable flowers wins the game. Learn more about Blume on Kickstarter here. I’m all about the tile-laying gardening games this week! In Gartenbau players race to grow flowers and earn prestige in order to win themselves the title of master gardener. 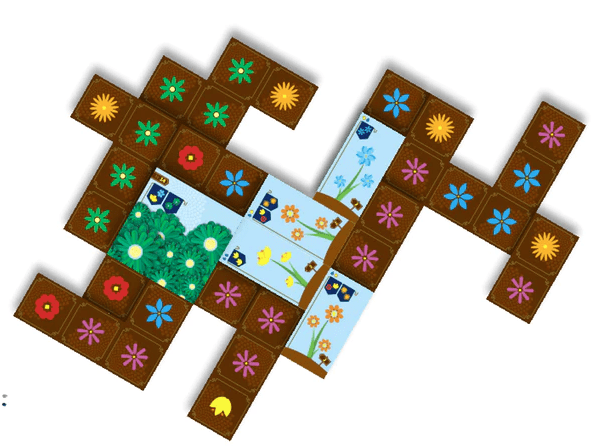 Players will start by drafting a hand of 4 flower tiles then on their turns they’ll take one of 4 actions: buying seeds, planting, gaining sun & water, or playing a flower tile. To play flower tiles you need to have the right combination of plated tiles so clever planning of your garden is key. Gartenbau looks like a fun, puzzley tile-layer that’s perfect for any gardener in your life. 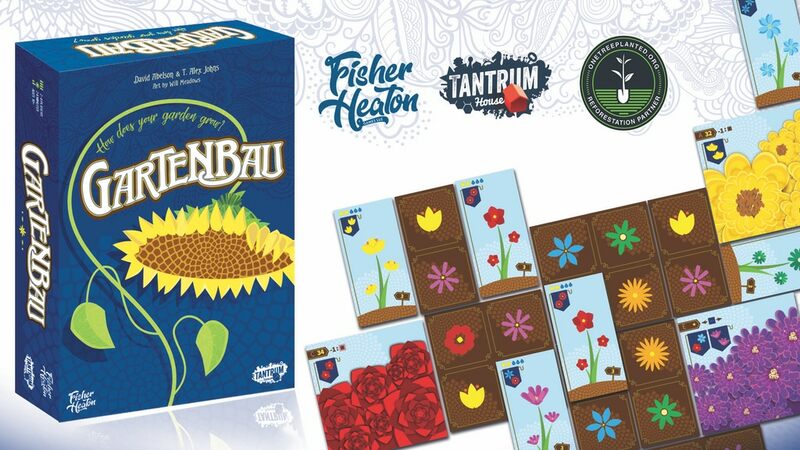 Take a look at Gartenbau here on Kickstarter. Alderac Entertainment Group is Kickstarting a deluxe version of Valley of the Kings, a deck-building game Andrew really enjoys as you can see in his Game in a Minute below. 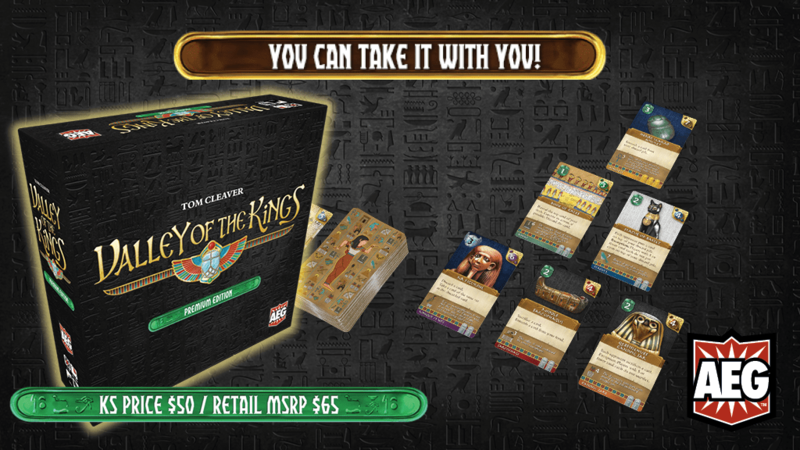 This version of Valley of the Kings includes the three previously released games, upgraded components, and new content. While we love the portability of the original small box game, the tarot sized cards and updated graphic design makes this new edition really appealing. Check out Valley of the Kings Premium on Kickstarter here.